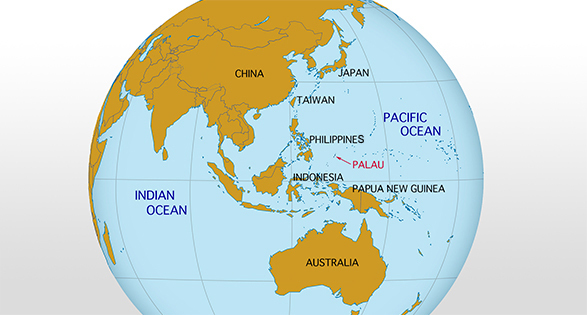 The latitude and longitude of Palau are about 7 degrees north and 134 degrees east. The archipelago lies within the much larger group of thousands of islands that make up Micronesia, which means “tiny islands.” Approximately 800 kilometers north of New Guinea, southeast of the Philippines, and southwest of Guam, Palau consists of roughly 500 islands. 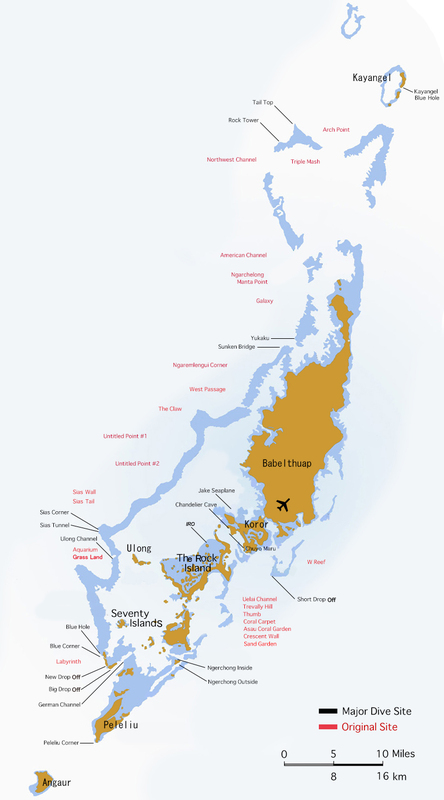 Palau has a maritime tropical climate with a large amount of rainfall. The average daily temperature for the year is 81℉ (28℃), while the relative humidity is about 82%. An annual average of 381 centimeters of rain falls on Palau, feeding into the rivers and streams and adding to the humidity. Wind direction shifts occur with the trade winds blowing from the northeast and east from November to May. Then the monsoon winds come up from the southwest from June to September. 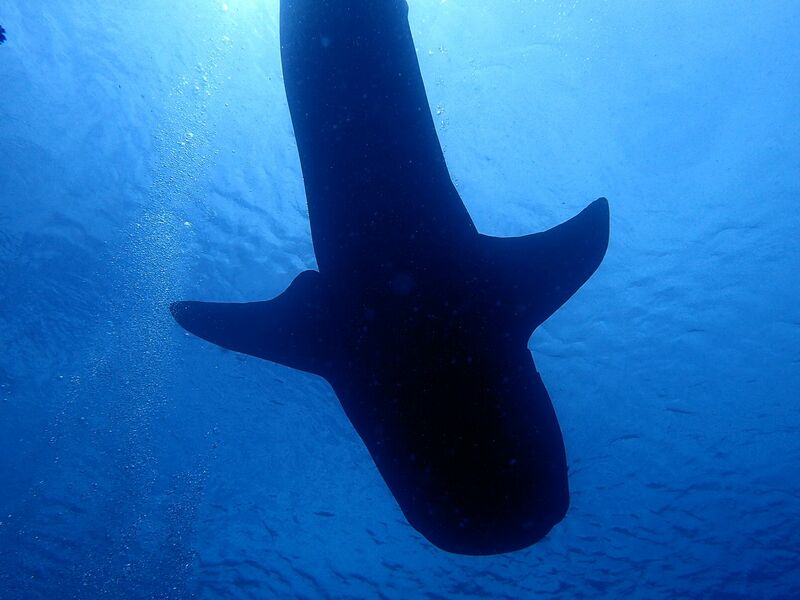 Palau has declared itself as the world’s first shark sanctuary. 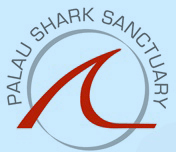 In 2009, it launched the Palau Shark Sanctuary to do its part in fighting for an end to shark finning in Palau and around the globe. Palau’s Rock Islands were listed as a World Heritage Site in 2012. 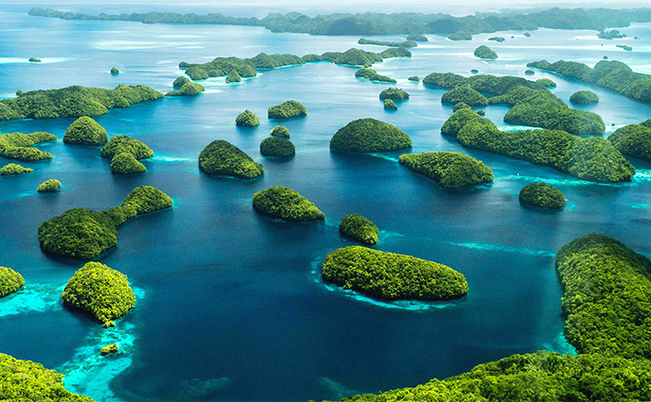 Many of the 445 uninhabited limestone islands of volcanic origin the southern lagoon have unique mushroom-like shapes, surrounded by turquoise water and coral reefs. 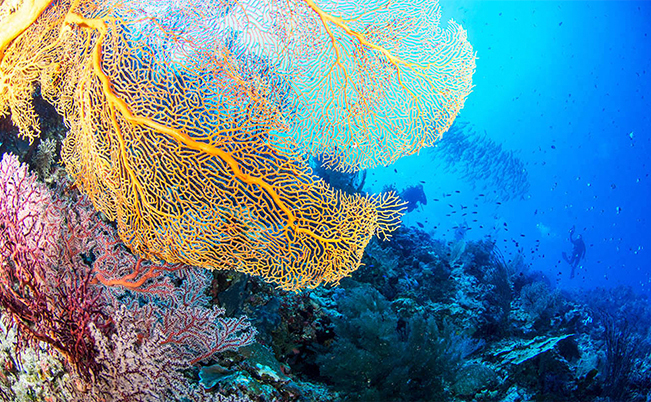 The site’s incredible beauty is made even more impressive by the complex reef system, featuring over 385 species of coral as well as a wide array of ecosystems. This is home to a great diversity of plants, birds and marine life, including dugong and at least thirteen shark species. Palau is known as one of the planet’s best places to be underwater. Its dive sites attract visitors for all sorts of reasons, including huge schools of fish, plenty of sharks, and healthy reefs, as well as wrecks of the Second World War and the world-famous Jellyfish Lake and Blue Corner. Most months the water temperature is around 30℃. Only from February to March does it occasionally drop to about 26℃. Average underwater visibility is roughly 20 meters but sometimes goes up to 40 meters! From July to September, heavy rains and strong winds can brings a drop in visibility to between 15 and 20 meters. 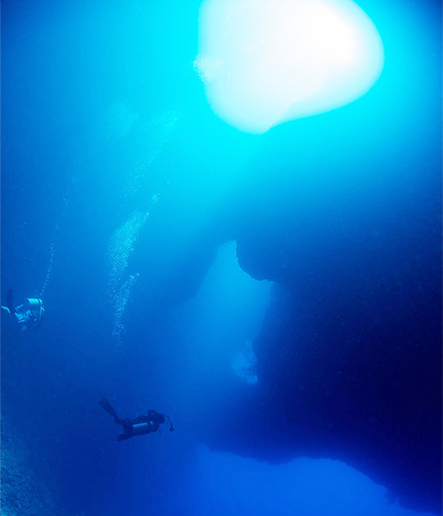 Palau features about 30 major dive sites, from walls and tunnels to channels and wrecks. 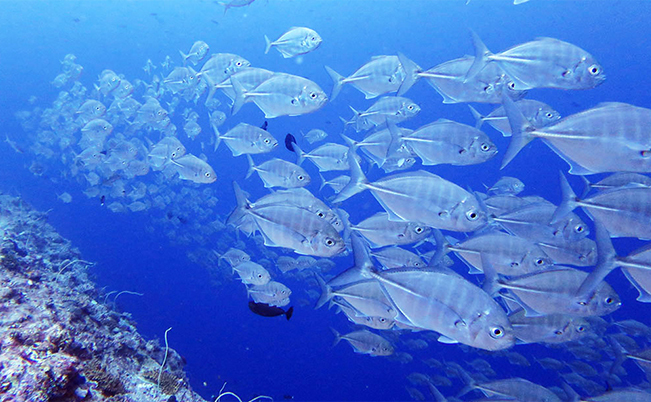 The most famous dive site in Palau is Blue Corner, mainly for it schools of all sorts of fish. 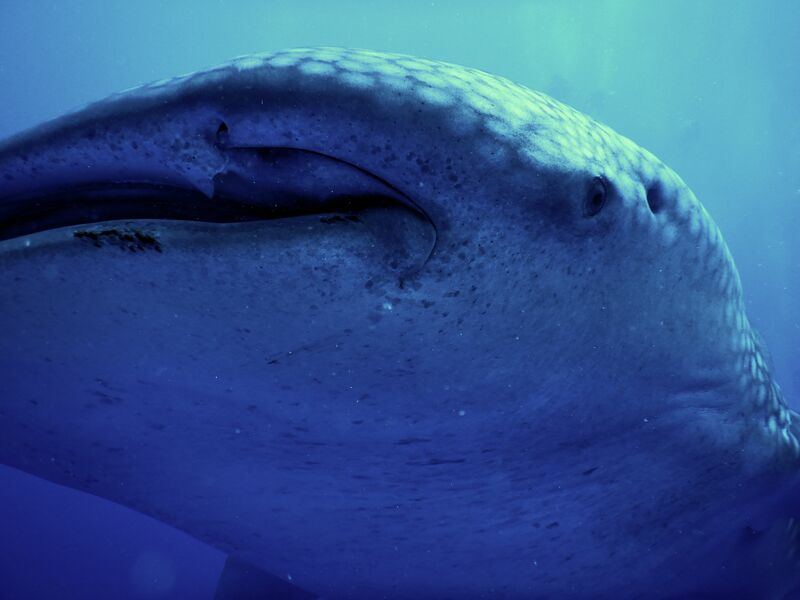 Here you can not only expect to meet great numbers of jacks, black fin barracudas and snappers, but you’ll also see sharks, tunas, wahoos, groupers, eagle rays, humphead wrasses (Napoleon fish), green sea turtles and hawksbill turtles—all in a single dive! And if you’re lucky you may even see manta rays or sailfish and perhaps even a whale shark! 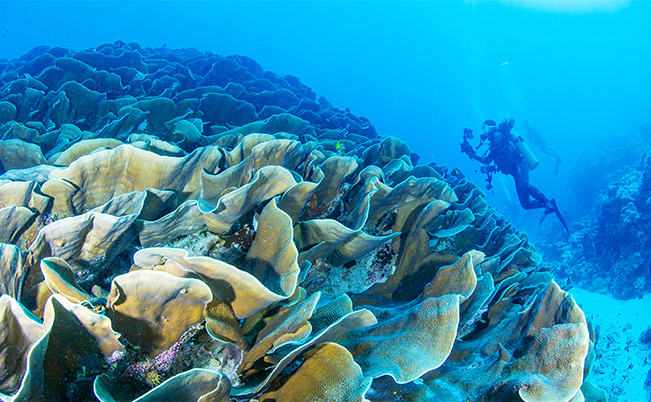 Like many other major dive sites, the currents at Blue Corner are what make it so special. Next to Blue Corner—or a northward continuation of this site—is Blue Hole. Four holes (about 5 × 3 meters each) drop down into the huge doom. This manmade channel cutting through a lagoon to the ocean was made by the Germans before the First World War. Although we’re not permitted to dive in the channel, as it’s too shallow and the current is too fast, we can dive at the channel’s mouth. 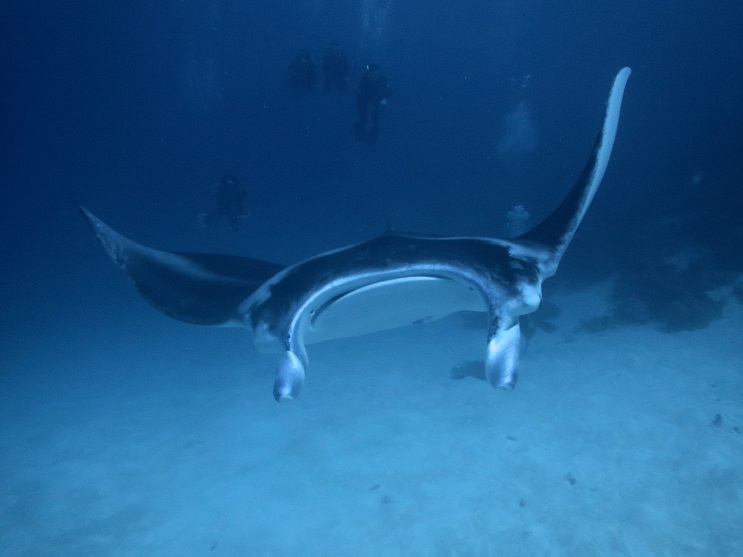 This site is famous for its manta rays, which come to the cleaning station. Their numbers increase during mating season, between November and February. There is also a huge number of garden eels on the sandy bottom, and eagle rays, grey reef sharks, white tip sharks and schools of fish are around too. The cleaning station is at a depth of between 18 and 22 meters—a mostly sandy bottom with rocky outcrops. 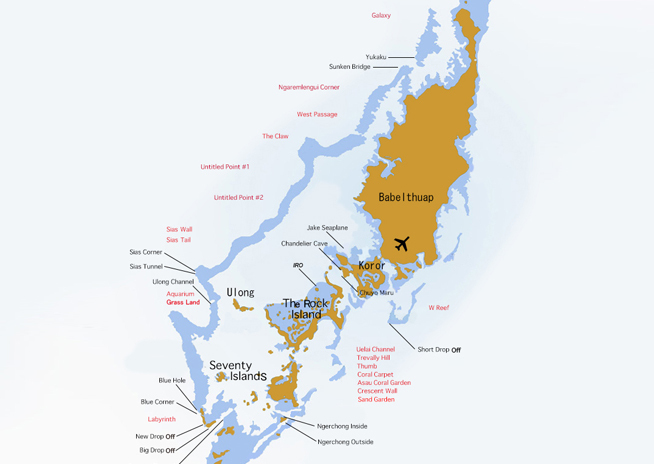 We were the first to develop this dive site, which is now quite famous. Come and see the impressively vibrant hard coral at Grass Land as well as its large patches of coral. 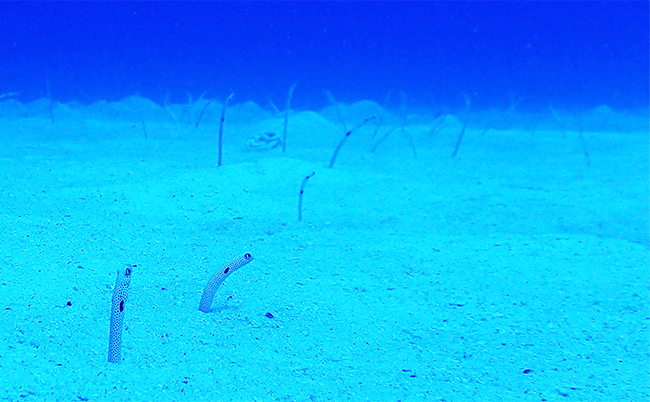 At a depth of 20 to 24 meters, you can see a field of garden eels craning their heads into the current to feed along the sandy bottom. We were first in the world to discover the large spawning grounds of the Bumped Parrotfish. Several thousand of these fish can be seen 3 to 4 days before a new moon, a very rare phenomenon. Descend the vertical wall and start drifting! You’ll see plenty of colorful soft corals and sponges, butterflyfish, angelfish, triggerfish, anemones, grey reef sharks and yellowtail fusiliers. What’s more, the W-shaped corner provides a great current, with an abundance of fish and sharks around. Humphead wrasses (Napoleon fish) are also common here, and the reef area is frequented by turtles. This shallow channel through Ulong Island’s lagoon is where we dive from the outer reef inward or the other way around, depending on the current and tide. Usually, we start at the outer reef wall, where you can enjoy beautiful coral and big schools of butterfly fish and yellowtail fusiliers as well as turtles. At the channel’s mouth, stop to check out the grey reef sharks and barracudas. After that, you’re funneled into the channel, which has a shallow sandy bottom scattered with coral. Its maximum depth is just 14 meters (average: 10 meters), and you can drift without fin kicks. With slopes on both sides, you will feel as though you are walking in a canyon. Many divers come to Ulong Channel to see the huge cabbage coral,and Schools of jacks and barracudas abound. 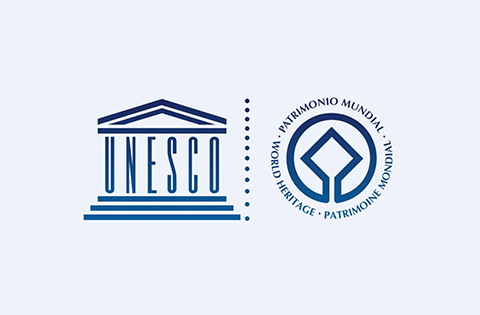 The Iro was sunk in 1943 during the Second World War and is now Palau’s most famous wreck. It rests upright on the sandy sea floor, 130 feet (40 meters) below the surface. The ship was 470 feet (143 meters) long and weighed 14,050 tons. 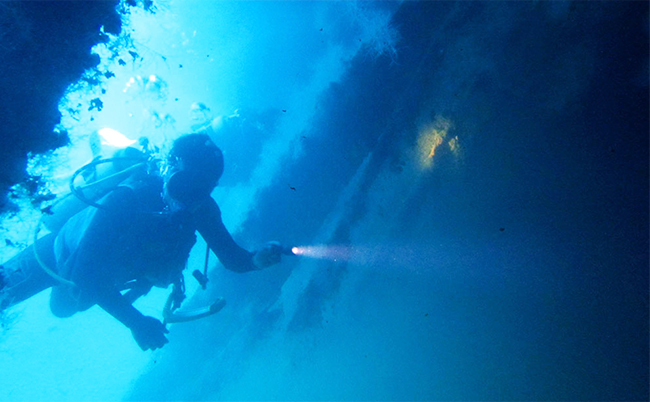 Located in Western Lagoon, only a few kilometers away from Koror, the wreck remains in good condition. Once you enter the water, you can clearly see her magnificent king posts stretching down to its deck 90 feet (27 meters) below. The posts are surrounded by zigzag clams and soft corals, and her spectacular 5.5-inch gun, covered with black corals, still rests on a large circular mount at her bow. From the bridge superstructure, you can access companionways and see the crew’s quarters, not to mention lion fish and anemones. Since our founding, we have developing new dive sites and now have more than fifteen of these, not only in the south west but also in the north and east. Cloudy sky passed on the way today, but it was almost fine weather. It was a pleasant weather. Temperature was 32 ° C, water temperature was 28 ° C.
It was warm pleasant day. There was a little wind, but I felt good. The boat was one, today. In German channel, I saw one manta ray was cleaning. It was just a short time, but she was a big one. The visibility became poor after the current changed to outgoing. It is a leisurely diving while watching many Bigeye barracudas and herd of scads. The second dive, I went to the Blue Corner. The current was little bit strong. We enjoyed good drift dive. Flock of Bigeye trevally, Bigeye Barracuda and a Humphead wrasse were seen. I took some photos with turtles. Also we saw a school of Barracuda. The current became slower in second half. In the lunch time, we saw few Dolphins dancing & jumping. The number was small but it enough to make us happy! Last dive today was at New Drop Off. It was slow outgoing tide. I saw egg of Orange fin anemone fish, Golden damselfish. Observation of scene where they grow up, fish during egg production make feels closeness even with fish. I introduced to my divers, some Pyramid butterflyfish, Bigeye barracuda and sharks. At last, we enjoyed to watch flock of Bluebanded snapper and Gold-lined sea-beam before safety stop. It was good diving day, because of good weather and good visibility. Palau was nice weather again today. 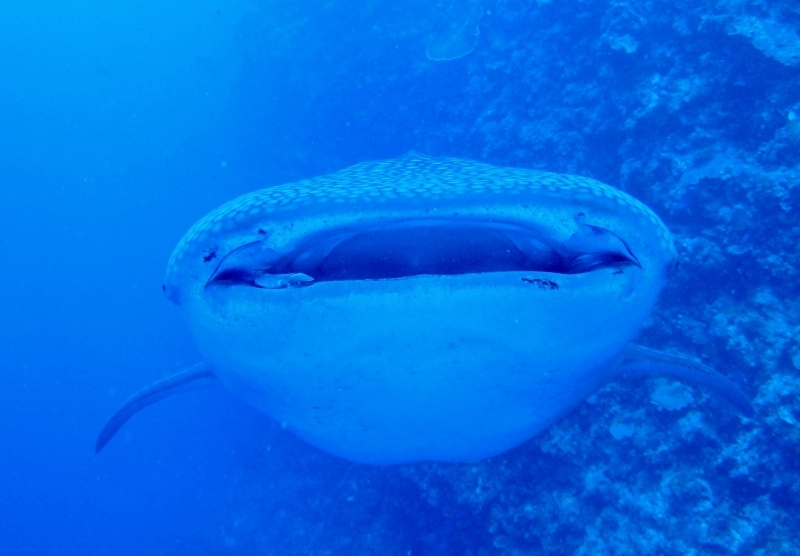 I went to the Ulong area where Whale Shark came out 2 days ago. I was expecting the whale shark come to us. I planed to dive Ulong Channel, but it was no current and I change to Ulong Cliff as today’s first dive. Many Bigeye Barracuda were there. 30 to 40 baby Grey Reef Sharks were coming to shallow area and looking for Bigeye trevally. It was easy to watch, because usually they are in deep area but today, they were in shallow area. A lot of Double-lined fusilier were seen at Aquarium. There were plenty of Double-lined fusilier on the front of my eyes, and the blue line was very beautiful. It was interesting to see a flock of Double-lined fusilier spread out to run away from Bluefin trevally. Also many Yellowfin goatfish were seen. Last dive I went to the Sias Corner. I was expecting the whale shark was still there. Although the current was not nice, there were lots of fish there. Yellowspotted trevally, Bluefin trevally and Dogtooth tuna attacked herd of scad. I think the number of scad has been reduced because it was after being fed. There were a lot of Hawksbill at the Sias Corner today. I met six Hawksbill in total. We enjoyed to watch small Hawksbill swam around us before we exit. and sometimes it rained and it changed sunny later again. The temperature was 32 ° C.
Depend on the location, I felt a little chilly, because the wind was blowing a bit. But there was no problem at behind the island. The west side area was quite calm. It was easy day to dive. The Blue corner was weak incoming tide. Immediately after entering, there were some Bluefin trevally were seen. Also followed by some Giant trevally were seen. Soon after, I saw a flock of Barracuda. The size was a bit small, but there was quite a lot! It was good visibility and no other dive group were seen at Blue Corner. We had Blue Corner to ourselves. There were many sharks in the hooking area. The gray reef sharks were swimming back and forth and it was great. We saw a white-faced shark today. She became a regular member of Blue Corner now. I saw her after a long time, but she looked fine. It is likely to become popular again from now on. The second we went to New Drop Off. It was mild outgoing current. We enjoyed a leisurely diving. I enjoyed drift dive and watching flock of barracuda, Pyramid butterflyfish and some sharks. We went up to the surface after watching Bluebanded snapper. 3rd dive was I went to Hafa Adai Wreck site with request divers. The visibility was not greater than outer reef site, but there were lots of fish. I saw many Bluefin trevally and flock of countless Redbelly yellowtail fusilier at the ship’s mast area. Also I found a lionfish and big puffer fish. I am looking forward to seeing what I can meet tomorrow! It was sunny from the beginning, then it was raining, then changed to sunny again and I saw the rainbow. The water temperature was around 28 ° C, and the temperature was around 31 ° C.
The visibility was good, it was calm without waves, it was easy to dive. But today a big star came out! And she played with us in whole one dive! ! ! ! I can not find any other words. The next photo is from the front. She seems to be very interested in divers. The photo is from Kaburagi. 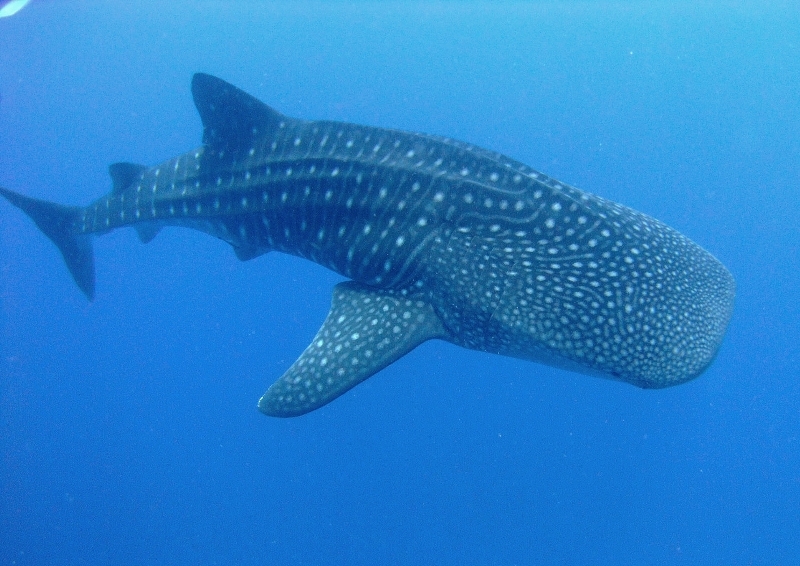 After all the star of today was her, the whale shark! This photo from Mr. Wada. What a super lucky day, today was!! Cloudy weather today, but it was not cold because almost no wind. The early morning tour group went to Shark city to see the spawning of the red snapper. They saw the ovaries in front of them. They said it was so powerful that all surrounding were white. Also they saw a bull sharks and a Giant grouper! We didn’t see a Manta-Ray in Grassland. But the visibility was good and it was a pleasant dive. Flock of scad & Whitetongue jack were chased by some trevally. I saw a big school of Bigeye Barracuda. Also flock of Whitetongue jack, Giant Barracuda and Barracuda were seen. At the Sias Corner, it was gentle current. Flock of Pyramid butterflyfish was beautiful. There were more than 20 sharks there! Also Dogtooth tuna & Yellowspotted trevally were chasing flock of scad was seen. There was also a Humphead wrasse trying to take a ride! At the chandelier cave, we enjoyed to watch small fish outside of the cave after inside tour. We enjoyed to macro watch about Crab eyed-Goby, Sebmented Bleni and Pajama cardinalfish. Of course, we saw Mandarin fish! Her body color is vivid and really beautiful! There were many clouds, but basically the weather was fine. The western dive sites were calm because it was an eastern wind. We had two boats today. 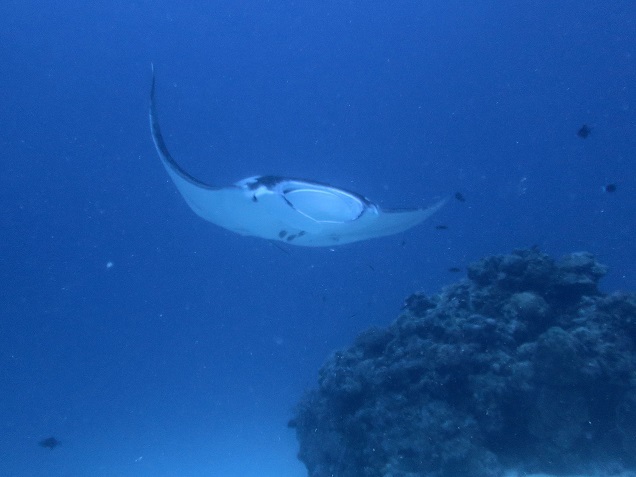 Yukaku expedition team saw 10 Manta-Rays! 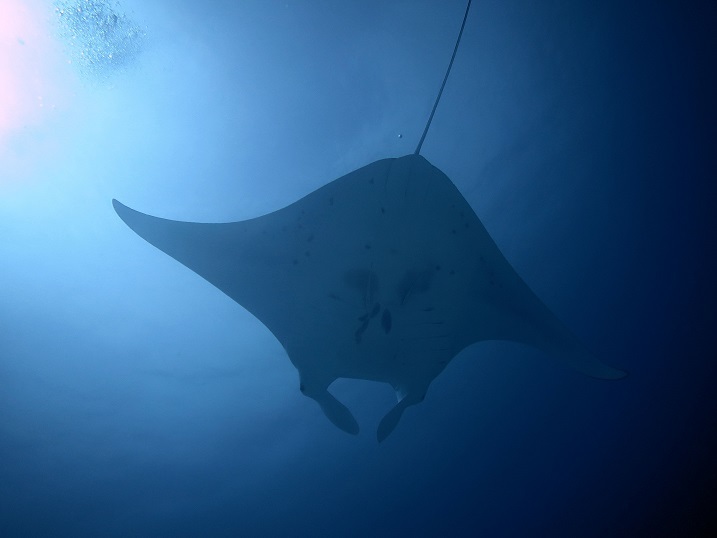 It has been long time since we saw Manta-Rays in Yukaku. They also saw 2 Black Manta-Rays. My boat went to Ngemeris. First dive was at Ngemeris wall. It was true blue water, very good visibility. We saw around 20 turtles. Easy to find them, because of good visibility. The second dive was at Blue Corner. We had good incoming tide. Recently the number of Bigeye trevally are getting increase. A big Bigeye barracuda was passing near by. We could see all kind of regular member of Blue Corner except Black fin barracuda. The third was at New drop off. Also good visibility with mild incoming tide. Flock of Bluebanded snapper were very beautiful. A school of Bigeye barracuda reflected sunshine, it was very impressive. I saw some green sea turtle swam very gentle. Very dense flock of Redbelly yellowtail fusilier was seen. Then I saw some Bluefin trevally were attacking them. All three dives were beautiful good visibility. We will have a Peleliu expedition to see the laying eggs of Red snapper in the early morning tomorrow. Palau was fine & hot weather today. Both boats went to Ngemeris. I was in charge of charter group continued from yesterday. This is a very lucky divers group because they met blue marlin and also they saw the court dance with Manta-ray & Black manta-ray. I planned to Blue Hole for first dive, but it seemed to be crowded. And I changed plan to Blue Corner. Beginning of this dive, we went to Macro Hole to take picture of Helfrichs dartfish and Elegant firefish. Then we went towards the top of corner by good drift current. Because of strong current, flock of Bigeye trevally spread to 30m deep near Macro Hole. I was surprised because I looked back after seeing small fish. After that, I hooked in at the top of corner, I felt good current. I found flock of Barracuda, but it was too far to get close under strong current. A friendly Humphead wrasse came and we played with her at shallow area. The second dive was Blue Hole. I saw another dive group and I was waiting and enter after them. I showed my divers about Squarespot snthias, Harlequin grouper, Diagonal-banded sweetlips and Flashing file shell. The divers were very happy to take photos. The last dive of today was Blue Corner. We had good upcoming tide and we saw good size of flocking Bigeye trevally. 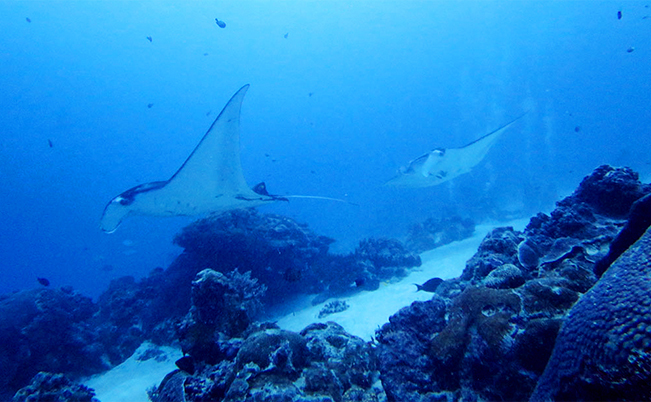 We enjoyed to watch green Manta-Ray (?) nearby. She was gone into the current. Other group also saw a Manta-Ray at German Channel. It was raining in the morning but it was sunny by the time we left pier. The temperature was 31 ° C, the water temperature was 28 ° C and it was a comfortable day. But the wind was strong and I felt a bit chilly on the boat. There were little rough surface in some places. The west dive sites can dive without problems, because it was northeasterly wind. The visibility felt down but there were a lot of fish. And today we saw Manta-rays in many places! Today, we had two boats. In Grassland, one manta came out. She was swimming slowly and got cleaning at cleaning station. Bigeye barracuda, Whitetongue jack, Scads and Garden eel were full of our sight. But today’s star was “Manta-Ray”. The second went to the Sias Corner. There was good outgoing tide. Many sharks were seen at hooking area. I saw many Double-lined fusilier. Also school of Barracuda, Bigeye barracuda and scads were seen. Boat 2 went to Grassland for 2nd dive and also they saw a Manta-Ray. The swam around’n round the cleaning station and came up to them. The divers were all very happy! Last dive, we went to the aquarium. There were lots of fish! We saw big flock of Double-lined fusilier. Some Bluefin trevally were chasing them. It was true spectacular scene! Wow, today is “Manta-Ray Day”! I wish Manta-Ray come again tomorrow too! All the photos were taken by Mr. Nakamura! Good weather in Palau today. The wind was became weak and the sea condition was good. The German channel had good visibility. I saw big “fish ball”, there were plenty of fish there. Many of Bigeye trevally and Bigeye barracuda were seen. At German channel, Manta-ray has not appeared recently, but it came out today! Manta appears from shallow area when we were watching the variable jaw fish on the sand. She passed by next to us and went to the cleaning station. She got cleaned for about 5 minutes and disappeared. One of my diver was very lucky because this is his first fun diving! The Blue corner was a superbly clear blue sea with great visibility. Bigeye trevally spread like a wall and that scene was amazing. Humphead wrasse came to us from the inside of the shelf while watching at the Bigeye trevally. Humphead wrasse, who appeared about three times today, thank you for coming a lot! A flock of barracuda also emerged from the shelf and passed next to us. You can see various fish easily, and it is truly a Blue Corner! Last went to New Drop Off. We enjoyed drift dive with good current to hooking station. Good size of school of Bigeye barracuda were seen. I saw many sharks and Pyramid butterflyfish. Also some Hawksbill & Green Sea Turtle were seen. 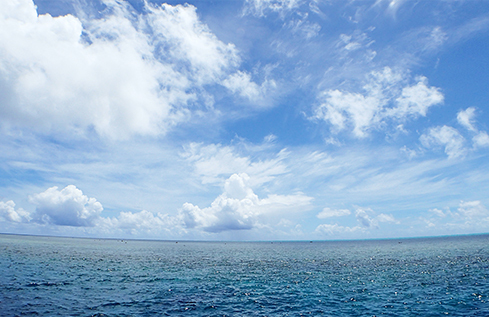 It was fine weather in Palau today. However, the boat court was essential because sometimes the wind got stronger. We have one boat and went to north-west area. The first run to Almonogui Wall. Until now there was no name there. Now we put the name “Almonogui Wall” there. No one took pictures. . .
Pacific drummer had interesting behavior they swam back in forth. I found the fish which unfamiliar with diver were very wild move. Many of Bartail fusilier and Yellow and blueback fusilie were seen. Also I saw flock of big Green humphead parrotfish. It was nice dive with good visibility and beautiful corals. The 2nd was to Bigeye trevally point. This is just temporary name we put today. As the point name of Bigeye trevally, we saw lots of Bigeye trevally there. Compare with Bigeye trevally in Ulong cliff, the Bigeye trevally here were not familiar with divers and they were very aggressive and swam very quick. I saw huge flock of Barracuda. It was more than 500! It was definitely the best flock I’ve ever seen! They were big and flock was very dense. 3rd was to West Passage. Although the visibility was lower than other 2 sites, but a good size of flock of Rainbow runner were seen. Also a school of Bartail fusilier were seen. Many Barracuda passed by just side of us. The number was not as big as previous site, but it was good number. I also saw a flock of Golden spadefish‎, but it was a bit far. As soon as this was noticed, it disappeared to deep area. There were also many Bigeye trevally. Their move was very interesting. It was very sunny today! It was awfully raining while moving, but it was fine by the time of arrival at the dive site. The wind was not too strong. The temperature was 31 ° C.
The water temperature was 27 ° C.
The visibility was not so bad. It depending on the place, some place was good, some place was not so good. Because of this is nature matter and we can not control that. The visibility was better in the afternoon. We had 2 boats today. One was went to expedition to North-West area. Other went to Ngemeris area. It is an expedition boat. I went to Yukaku. She was just cleaning her body at the station. They might be remember the location of the cleaning station. Is there any communication way between them? There is no answer even thinking, but it is fun even it just thinking. At the Ngemeris Wall, a turtle, Blacktail snapper and Yellowmargin triggerfish were seen. The current was slow, we had a leisurely dive. This dive was to see turtle and we saw many of them. Yellowmargin triggerfish were now in the spawning season. It is a fish that is unwelcome by divers very much, but they are making their eggs and just try to protect their eggs. So I told to my divers that do not come close them and not chase them. The Blue corner was fish Heaven. There was a lot of Giant trevally. Great Barracuda attacked there, but they missed it. Their predator mode was fully and it was exciting scene. New drop off was outgoing current. We had relaxing drift dive and enjoyed watching turtles and Yellowmargin triggerfish. The weather was fine today and it was a pleasant day. Today was sunny, cloudy and sunny again! And the rain sometimes, it was a unstable weather. I was able to dive while running away from the rain. Today’s temperature was 30 ° C-32 ° C.
Water temperature was around 28 ° C.
The wind was blowing a little, but it was a comfortable day. One is an expedition for north-west area. Expedition in the area of Yukaku. They were done 3 dives in Yukaku. At the Sias corner, there was still outgoing tide in the morning. The tide became strong and weaken alternately. We had long drift dive. While drift dive, we enjoyed to watch many Double-lined fusilier, sharks and Pyramid butterflyfish. I saw a turtle and beautiful flock of Purple queen. Purple queen & Peach fairy basslet were beautiful shinning by sunlight. When I used hook, I saw 8 Pyramid butterflyfish attacked Double-lined fusiliers. Some small fish was running away. When it runs away, it scatters, but at the next moment, it is beautiful to go back together again. This escape scene is worth seeing! The second dive, we went to the Aquarium. It looks like an aquarium. There were a lot of Double-lined fusilier. The amount of Double-lined fusilier were so great. It was fun, Double-lined fusilier were everywhere. It was a good timing, very nice current. 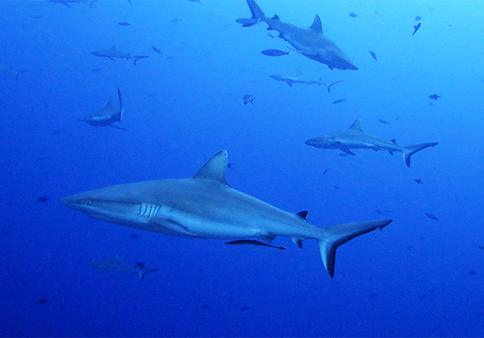 There were a lot of gray reef sharks at the entrance. I found many baby sharks at there. I saw 2 adult sharks and about 30 baby sharks. The kid’s sharks looked in the same shape of a adult shark, just small size. There were many Yellowmargin triggerfish at the sand area. Be careful not to get too close after spawning, as it will become make aggressive them. We will have two boats tomorrow! It was a nice weather in Palau today. It was a bit windy & bit chilly on the boat but the weather was good and it felt good! The temperature was 31 ° C to 32 ° C, the water temperature was 28 ° C.
The visibility was good enough, it was about 25 meters. Because the current was a little faster, we started diving carefully in a timely manner. Today we had two boats. The Blue hole had good visibility, and there was no other group. We enjoyed to watch Randall’s fairy basslet and Flashing file shell. Also Crimson sea bream and Gold-lined sea-beam were seen. I found a zebra sea snake at shallow area. The current became stronger at Blue corner. The friendly Humphead wrasse came up with us. We saw good number of Bigeye trevally. There were plenty of fish, flock of Giant trevally and some Mackerels. Last dive was at German channel. Unfortunately I could not see any Manta-ray. But the visibility was good and I could leisurely diving easy to see such scads, barracudas and flock of Black and white snapper. I saw some Jawfish which came out from the nest. It was rare and very interesting! We’ll start 2 boats tomorrow. I’m looking forward to what will come out tomorrow!